Running Time: 2 hr. 52 min. The overarching irony to D.W. Griffith’s 1916 masterpiece Intolerance, a colossus comprising four stories spanning 2,500 years meant to illuminate mankind’s unceasing penchant for injustice, is that was made partly as a response to groups who (rightly) attacked Griffith’s The Birth of a Nation as bigoted and extolling the Ku Klux Klan. While the motives behind Intolerance’s creation are dubious, there’s no debating its scope and influence. 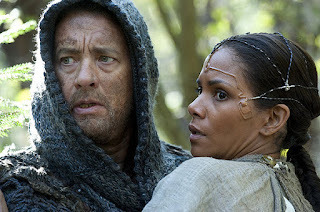 Few films since have sought to so directly duplicate Intolerance as Cloud Atlas. Simultaneously engrossing and infuriating, this spiraling adaption of David Mitchell’s 2004 novel spans six interwoven storylines, beginning with a Pacific Ocean voyage in 1849 and ending hundreds of years hence. In between, there tales about a young amanuenis and Cambridge outcast (Ben Whishaw) struggling to survive as a gay man in 1930s Europe, an investigative journalist (Halle Berry) fighting to uncover the dangerous ties between nuclear power and oil companies in the 1970s, and a mini-revolt led by a genetically-engineered clone named Somni-451 (Doona Bae) in totalitarian Neo Seoul, circa 2144, where fabricants are used as slave labor (and sometimes worse). The puzzle-piece plots are both thematically and narratively connected. The main character in each timeline discovers the tale of the preceding one via evolving modes of storytelling, from diaries and letters to a book manuscript, a movie and a holographic recording device. The final plot thread, set in post-apocalyptic Hawaii, is shared a millennia away by an old man (Tom Hanks) to a group of children gathered around a simple campfire. The common refrain to each story is the corrupt, oppressive nature of mankind and its propensity to subjugate others for the sake of selfish gain. In a film full of cannibals, slavery and futuristic floating cars, the most wacky story might be a modern-day parable labeled “The Ghastly Ordeal of Timothy Cavendish.” There, the titular book publisher (Jim Broadbent) goes from being unexpectedly flush with cash to fleeing a group of gangsters to being involuntarily confined to an old folks home reminiscent of One Flew Over the Cuckoo’s Nest, down to a Nurse Ratched variant played by Hugo Weaving. If it sounds like Cloud Atlas is all over the place, well, it is. The initial flow of the film evokes the early establishing scenes in Magnolia—both movies also share an alternating blend of gonzo humor and deadly drama. Much of the cast—including all the leads—play multiples roles spanning each episode that sometimes cross gender and racial lines (the closing credits match actors with their parts, including several surprising reveals). While it’s uneasy to watch white actors in epicanthic yellowface (or Berry as a white trophy wife in one chapter), the device does further (and, indeed, often shoulders) the film’s notion of our collective continuity through time. I’m still waiting to hear exactly why that notion is important, though. Any film conceived by Tom Tykwer (Run Lola Run, and little since) and Andy and Lana (née Larry) Wachowski (The Matrix, and little since) is going to be spectacle first, not that there’s anything wrong with that in a movie lasting nearly three hours. But the film is also as bloated as the number of directors employed to make it, traversing not only time and space but also movie genres. Ironically, the filmmakers foist contrasting methods to force-feed a story about connectivity. Moreover, it is telling that only half of the six storylines would make compelling standalones. As a fantasy hodgepodge, Cloud Atlas as a whole is far greater than the sum of its disparate parts. Still, breadth—no matter how impressive—does not necessarily equate depth.